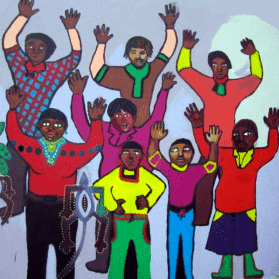 Sophiatown Community Psychological Services seeks to contribute to the creation of a society in which emotionally healthy individuals, families and communities are able to work together for the common good of humanity. Sophiatown Community Psychological Services strives to provide culturally and socially appropriate forms of psycho-social support to economically disadvantaged individuals, families and communities in distress; to build and strengthen networks of support for vulnerable individuals and families in communities; and to continuously work with others towards social justice and constructive social change. Psycho-social and psychotherapeutic work is in essence the work of creating, reclaiming and sustaining hope. The people who seek out our services are, more often than not, those who have lost hope. They can no longer see beyond the pain and suffering of the moment, and in the daily struggle for survival a sense of agency and future simply eludes them. For all of us life is about more than survival. We have an innate desire to thrive, to find meaning, to love and be loved, to nurture and grow others. Hope and a sense of future beyond the needs of the moment is what gives us the courage to move on even in the midst of pain and despair. We therefore often think of our organization as a Hope Factory – a dynamic space within which hope is nurtured and grown. People bring us their thin stories of suffering and deprivation and through a process of exploring inner and outer resources, they emerge with much thicker and richly textured narratives of self and their ability to act on their world.